Less than a month since the first transatlantic flight between Liverpool and New York took off from John Lennon Airport, the route is being cut back. FlyGlobespan said there will be fewer flights on the route due to poor passenger numbers and a series of technical problems. These difficulties have led to cancellations and lengthy delays. A spokesman from the airport said: "It's frustrating but we are optimistic about the future." 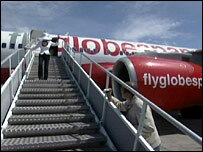 FlyGlobespan said: "Poor passenger numbers are making it impossible to sustain a daily service. "We are currently working out the best way to implement this change to the service." It is thought the daily service will be cut to four or five flights a week. Robin Tudor, from John Lennon Airport, said: "It's very frustrating - the airline are frustrated, we're frustrated. "Any new service needs a good start and New York is a great destination. "We're looking forward to the future and hopefully we can move on from here. "We've still got four flights a week from Liverpool to New York," he added. "A few years ago we would have leapt at that opportunity. We are still very optimistic."